Gerbera is a modern sans serif font family with prominent elegant appearance. It looks traditional yet quirky and has a quite distinguished humanist touch. Gerbera combines organic and geometric elements to give you a highly legible font family that works equally well in both display and longer texts. The designers of the typeface achieved this result by employing simple but very clever solution – they used reversed stress and pinched terminals on the strokes. Great care was taken while creating Gerbera font family in order to give the users wide variety of choices. 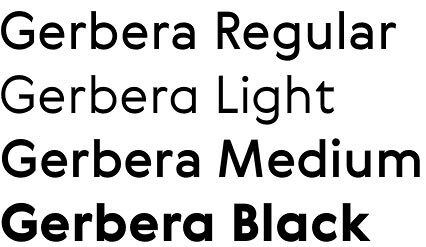 It comes in five weights – Light, Regular, Medium, Bold and Black. Vast range of OpenType features are provided too – proportional lining, tabular lining, proportional oldstyle, tabular oldstyle, small caps, no fewer than eight sets of stylistic alternates , case sensitive, arrows, circled numbers. We have to mention the rich language support for languages based on the Latin alphabet – Western, Baltic, Central European and Turkish as well as Cyrillic. 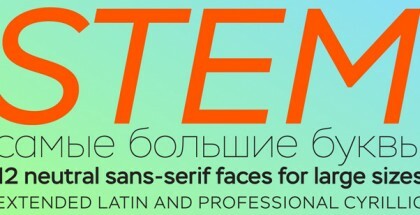 Gerbera font family is designed by Gayaneh Bagdasaryan and Vyacheslav Kirilenko – the principals of the well established Moscow based Brownfox type foundry. They once again used their great professional experience and extensive knowledge of the typographic traditions to provide us with a nicely crafted font that is up to the latest technical standards. Here are other examples of their remarkable work: Formular, Activist, Brutal Type, Geometria. 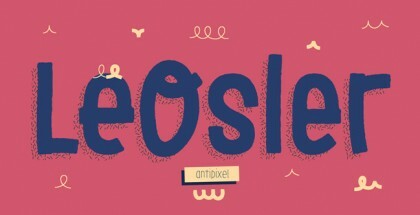 Get Gerbera font family and enjoy its quaint beuty!